The dashboard is an at-a-glance view of your IDrive account. You can view, manage, and monitor your IDrive account activities from the dashboard. 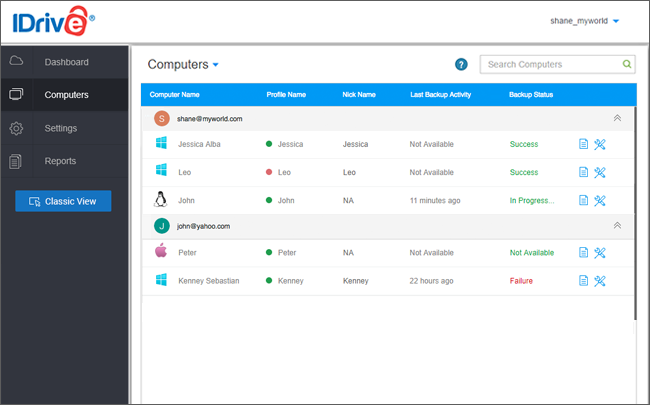 Remotely Manage your computer with robust reporting tools in near real time response. 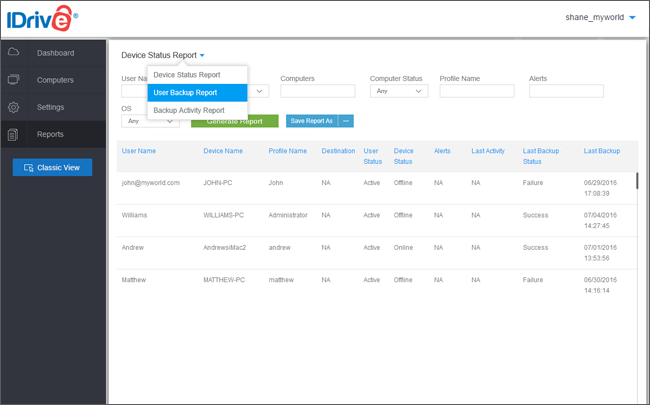 IDrive Dashboard makes it easier than ever for IT Managers, Administrators, and families to easily check on the health of their backups. data backups on the remote computers, create new user accounts and more. the information about each user's storage utilization and the most recent backup performed by them with the results. to backup sets and settings across all devices with the push of a button. The dashboard helps you remotely upgrade to the latest version of IDrive on any far-away computer. Admin can generate various reports like Device Status Reports, User Backup Reports and Backup Activity Reports. Create policies with required settings and propagate them to any particular group of users. View the devices attached to your account and change settings for more than one device. Create new user accounts within your storage space and define their encryption type (private or default). Create large number of user accounts in one go. Manage and propagate settings to users, by organising them into groups. Invite your associates, to setup IDrive account within your storage space. 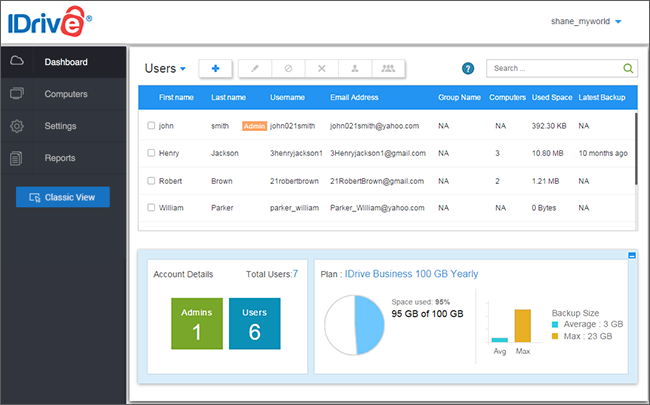 Manage data backups of all the users via the Dashboard. Through the 'computers' tab look at all the devices attached to your account in one screen. Check the most recent backup, and whether or not the backup was successful. 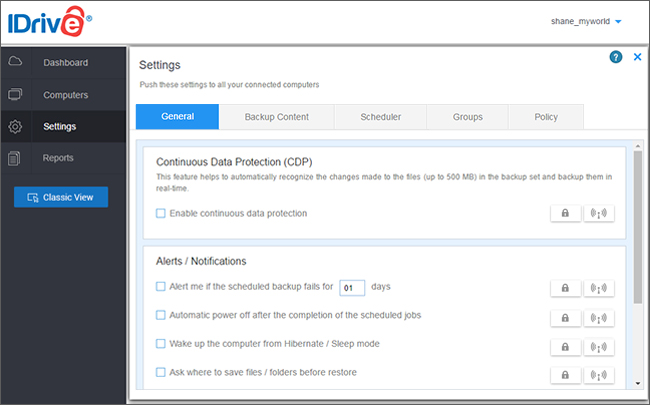 Remotely manage the device settings, its backup set and schedule. Change settings for more than one device quickly. The 'Settings' tab gives the power to globally update settings. Modify the backup sets and schedules. Create policies with required settings, add groups, and propagate to instantly push them to groups. Admin can lock the particular settings for groups or users. The users or groups cannot modify those settings, till the Admin unlocks it. The dashboard is an at-a-glance view of your IDrive account. You can add / edit users, block, delete them or make admin. Manage your data backups, restore files / folders to the corresponding computers, modify application settings, view logs and do much more on each of your connected computers. You can configure your IDrive settings and Push changes to all the connected computers with ease using this option. You can use reporting tools to create various reports like Device Status Reports, User Backup Reports and Backup Activity Reports quickly. Create new user accounts and propagate settings to users by organising them into groups.